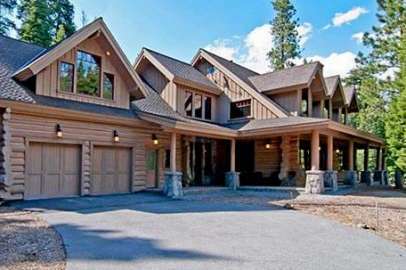 Lake Tahoe luxury homes combine the beauty of Lake Tahoe’s natural elements, the gorgeous panoramic mountainscapes and crystal clear waters of Lake Tahoe, with the finest in elegant architectural designs. These luxury properties range in style, size, price and location with most starting over $1,000,000. From sprawling Tahoe lakefront estates to rustic cabins, each home is unique and has something that makes it a luxury home for sale at Lake Tahoe. The Lake Tahoe luxury lifestyle is all about recreation, indoors and out. Relax in your own private movie theater, prepare dinner in your gourmet chef’s kitchen, or watch the snow fly from the warmth of your hot tub with panoramic lake views. Listen to the fireplace crackle and watch the sunset through your grand floor to ceiling windows. However you choose to spend your time, you’ll have the means to do so comfortably throughout every season when you own a luxury home in Lake Tahoe. With communities that meet every lifestyle, you’ll find a Lake Tahoe neighborhood that fits. Lakefront and boating enthusiasts should head to Carnelian Bay and Dollar Point where charming cabins and hidden wooded estates can be found. These communities share views of Lake Tahoe and the Sierra Nevada mountains, with multiple access points to the water. Tahoe City and Truckee are never far away, so if you dream of a living in the seclusion of the forest, but still want to be close to fine dining, shopping, and an epic nightlife, then Lake Tahoe luxury real estate is for you. Resort communities and offer the quickest access to outdoor recreation, a gondola to the slopes could be just a few steps from your front door in Squaw Valley or Northstar. Quiet designer condos, spectacular lodges, and grand estates are some examples of the Lake Tahoe homes for sale you’ll find in the Northstar, Alpine Meadows, Squaw Valley, and Martis Camp resort communities. Golf can also be enjoyed throughout the summer at Martis Camp, the community includes access to the top private golf course and attractions like the Aerial Adventure Park. For a quieter, more traditional golf course communities consider Old Greenwood, Lahontan, or Gray’s Crossing, located in historic Truckee. These communities are ideal for those seeking a luxury home. Lake Tahoe luxury real estate can also be found within gated communities that are not part of a resort, such as Fleur de Lac at the Tahoe Pines and Chambers Landing south of Homewood which includes a selection of opulent lakefront condominiums. Living within a gated community includes access to private community amenities such as clubhouses, piers and boat launches, tennis courts, gyms, pools, beaches, community activities, and often so much more.